President-elect Donald Trump has marketed himself as a business genius throughout his campaign. His economic savvy was recently called into question, however, due to statements he made about how he intends to avoid business conflicts of interest while president. Trump promised to put his assets in a blind trust controlled by his children, which seems to indicate that he doesn't understand the concept of a "blind trust." So what is a blind trust, exactly? A trust in which the trustees have full discretion over the assets, and the trust beneficiaries theoretically have no knowledge of the holdings of the trust. The trustor initiates the trust and maintains the ability to terminate the trust, but otherwise exercises no control over the actions taken within the trust and receives no reports from the trustees while the blind trust is in force. The purpose of a blind trust is to prevent the trustor from knowing exactly where their money is invested, to prevent them from acting in their own self-interest. The trustee, as a result, must be an independent party. The first American elected official to create a blind trust, according to Vanity Fair, was President Lyndon B. Johnson, who created a blind trust in order to keep his Texas television station, KTBC. A trust was created by attorney Sheldon Cohen at Arnold & Porter (which, Vanity Fair noted, was the firm of Johnson's "close friend and counselor Abe Fortas"), and control of the station went to two Texas lawyers who were friends with the Johnsons. But while it's reasonable to imagine that business information could be kept confidential by an acquaintance and even friends, it's harder to imagine that someone's children could be sufficiently "independent" parties. 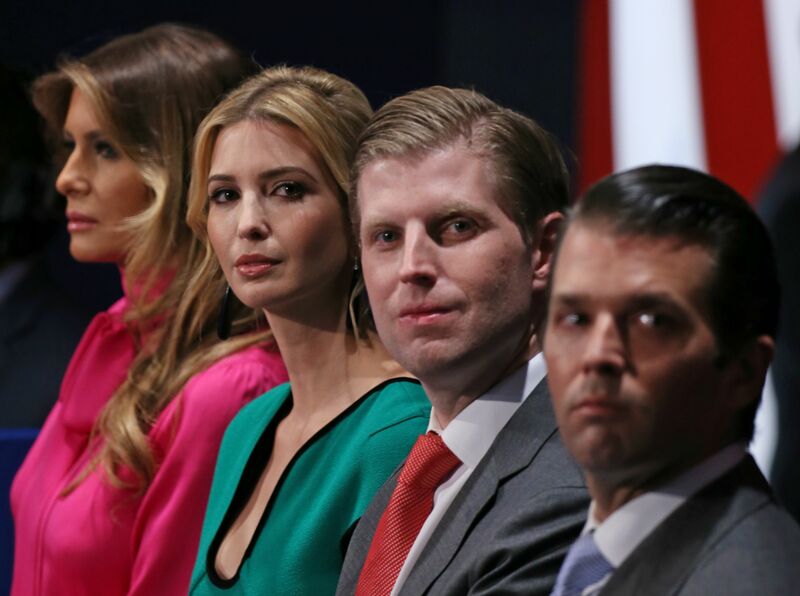 As Darren Samuelsohn wrote at Politico, "putting Trump’s children in charge of a set of assets that their father is aware of does not constitute a blind trust." Maryland Sen. Ben Cardin announced on Tuesday that he plans to introduce a resolution requiring that Trump entrust his businesses to someone unconnected to him. Cardin cited the Emoluments Clause of the Constitution, which forbids government office holders from accepting "any present, Emolument, Office, or Title, of any kind whatever, from any King, Prince, or foreign State" without Congressional consent. "Unless he takes appropriate action, Mr. Trump’s many international financial interests pose a great risk of violating the Constitution once he assumes the Presidency of the United States," Cardin said in a statement on his website. However, not everyone agrees that Trump's children have no place in a blind trust. Longtime Trump supporter and former New York City Mayor Rudy Giuliani argued that Trump should be allowed to hire his children as trustees because failing to do so "would put [them] out of work." Still, even if we took Giuliani at his word — and I highly doubt Trump's children would descend into unemployment and poverty if their father agreed to a true blind trust — I would argue that Eric, Ivanka, and Donald Jr.' s professional gains matter little when when the alternative is a presidential conflict of interest on an unprecedented scale.